At present, China’s metal ore is in the state of deep production. Thus the hardness of minerals is very high. 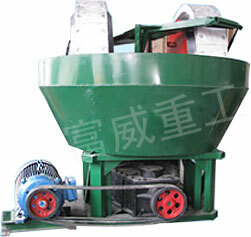 To work out this problem,we successfully designed a new-created conical mixing grinding pan mill which is uniquely used up the hard ore.
On the basis of original equipment,a scraper device is added to keep material layer 4-5 cm.Only under this state,swaging effect is excellent.In addition,fine material can be quickly cleaned away from mill groove.